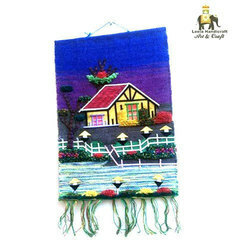 As per the specific needs of the clients, we are engaged in providing a high quality range of Patch Work Wall Hanging. 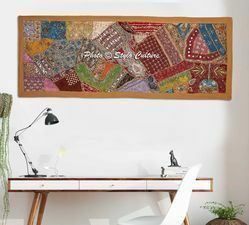 Exclusively hand crafted WALL HANGING with fine ceramic and stonework on it done by our specialized craftsman.Bright colours gives special INDIAN LOOK. - with small decorative bells hanging on bottom strip. We are involved in providing Patch Work Wall Hanging. We are renowned manufacturer, wholesaler and trader of Patch Work Wall Hanging. description: available in attractive colors & patterns. size can be customized as per requirement. This is hand made-made piece with wooden base and m-seal, ceramic work on poster of a lady (village scene). 1) The product can be hanged in drawing rooms to enhance the look of your room.